It’s end of the school year time around here, and if you are like me, you find yourself trying to stretch a dollar to give a token of how deeply you appreciate how AMAZING your kids’ teachers are! Today, we delivered some “refreshing” gifts. And let me tell you, THESE ladies deserve a little refreshment after a school year of wide open four-year-olds! My default color choice is pink and green. Just such a happy combo, don’t you think?? It’s great to have a color palette to help guide your selections for the gift basket. Gather your supplies. 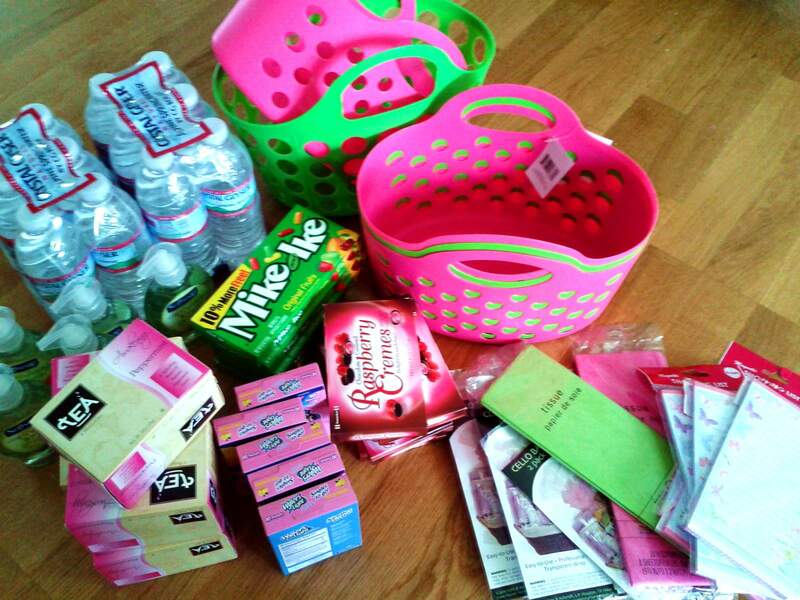 I chose candies in pink or green boxes, green hand soaps, pink lemonade packets, peppermint tea (which was in pink boxes for some reason), notepads, and some pink & green tissue paper. I hit the dollar store for some cute pink & green shopping/beach baskets (these came from Dollar Tree, but I’ve seen the same and similar baskets at other dollar stores, too). And I grabbed some bottled water. First, line your basket with a couple of sheets of tissue paper. Tear off the label from the water and tie a ribbon around its neck. I added a little printed tag with a verse to one of the two water bottles in each basket (I changed the he to she). 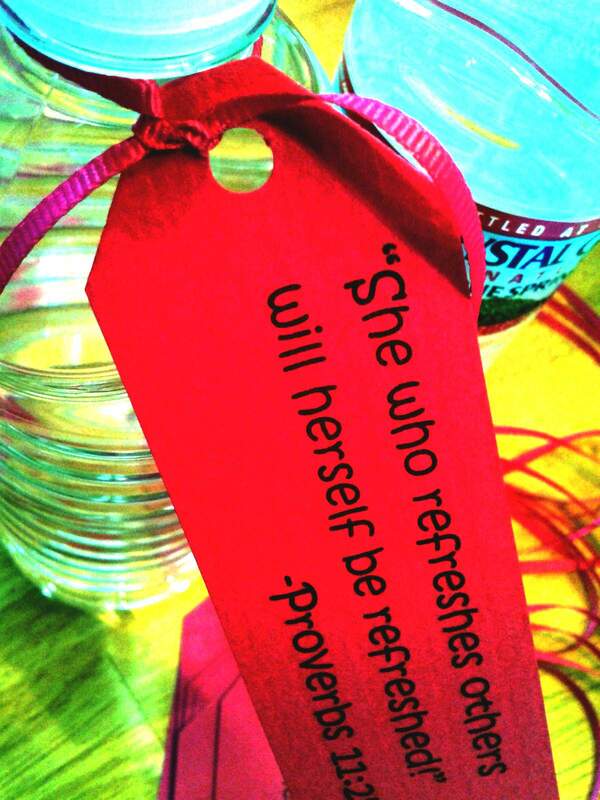 She who refreshes others will herself be refreshed (Proverbs 11:25). Next fill the basket. Pretty simple, right? Make sure to try to balance the weight as you fill (so one heavy water on each end; add tea bags, soap, and pink lemonade mix wedged in the middle; then boxes of candy & notepad along either side). Finally, “wrap” the basket in a cello bag. [I actually decided to do this only with the gift for the teacher who was absent today, leaving everyone else’s open so they could dig right in.] Tie it closed with a thick ribbon, and don’t forget the tag (write or print on colored cardstock)! 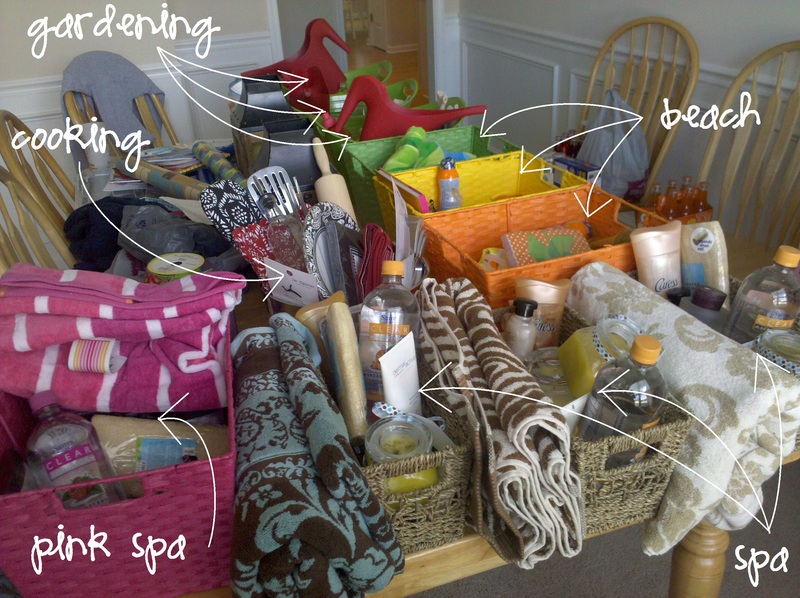 I love to lay out all the “fillings” in my workroom on the dining room table, and go to work! AND… if the budget allows, ADD GIFT CARDS! A $5 giftcard from Starbucks or Sonic can be tucked into a [ask for a free] tall or small Starbucks or Sonic cup. Target, Walmart, and teacher supply store giftcards are also always appreciated. If it’s a group gift and the budget is bigger, a giftcard to a spa or restaurant is awesome, too! So, what did I forget? Do you ever make gift baskets? How to you love on those spectacular teachers of yours? Gina, can I come teach your kids? 🙂 Too cute and great tips! Don’t forget to include a card written by the student. As a teacher notes from my students are the most precious gifts. Of course gift cards are nice as well. Thanks for the tips, Gina. I love your blog. Where did you find your baskets? I have been looking for those exact baskets for months!!! One of my favorites is the Movie Night basket: microwave popcorn, sodas, candy, popcorn containers (dollar store), and a $5 gift card to the local video store. Yes, that’s a great one! I’d have to say I’m partial to a $5 redbox giftcard–so convenient!! Can you get redbox giftcards directly from the machine or where do you get it? Thanks! Hello im having a baby shower in July and would love to do some type of gift basket’s for prizes what would u suggest to do? I’ve done nursing station baskets before – a basket to put next to the chair where mom ends up nursing or bottle feeding the baby most often. Find a basket that can be carried over one arm, ideally, and fill with things like a reusable water bottle, nuts and protein bars for mom, baby q-tips, nail clippers, small notepad & pen for recording changes/feedings, baby teether, burp cloths, a bib, etc. Some larger things you could add are a nursing cover, an Itzbeen timer, or a gift card. I’ve also received bath theme items packaged in an infant tub and diaper changing theme baskets. This idea is just what I need! Baby shower being given by my friends, a “Granny shower”, for daughter who at 42 is having her miracle baby! Was thinking about hostess gifts. This is great! Thanks! This is such a great idea- and so creative! And the items you place inside can really open up your creativity. Thank you for these ideas! I love that idea! And adding the name to the tumbler in adhesive vinyl if you have a cutting machine (to cut out the letters) is fun, too. Or on a REALLY tight budget, or if you just have 10, 20, or more teachers you’re buying for, you could use water bottles, like in my post here: http://wp.me/p29yYX-EE. Thanks for your comment! Thanks for bringing up the allergies, as one who suffers them, I was wondering about that as well! I try to get people to just get me unscented things, rather than try to list all the fragrances that do or don’t bother me. Frangrance-free is always safer! It’s a gift!! If they are allergic they can give those items to someone..It’s the thought that counts. Remember.. I have also done baby gift baskets, but used a diaper bag as the “basket” (most recently I had a bag made in John Deere fabric for my sister in law’s baby shower), and fill with a few small baby toys/teethers, teething tablets, fingernail clippers, a bottle, pacies, travel sized baby shampoo and lotion, diaper rash cream, infant tylenol and gas relief medicine, a travel pack of wipes, and an outfit. These are my absolute FAVORITE “baskets” to pack, they’re so much fun to pack for! I’ve done a slightly cheaper version with using a cool re-usable shopping bag from Toys R Us or even from Dollar General (they have neat character ones, like Toy Story and Cars)! Another idea I’ve used is baskets for college students. I’ve used backpacks, crates (the kind that stack or become bookshelves), and storage ottomans. Fill them with school supplies, snacks, dishes and silverware, cleaning products, bedding, board games and card games, etc. Pick a theme and run with it! Love love love giving gift baskets! It’s so much more fun to buy and more fun for the gift receiver to open! Brilliant ideas! I love them! Thanks for sharing!! Love your Ideas but i still need some help. Ever hear of BUNCO. I need prizes ideas. I love the dollar tree but just not sure if it will look bad if that all I do. HELP!!! Great ideas!! But I was wondering if you had any suggestions on a gift basket theme or ideas of things to add for even a non-themed basket for men? One that isn’t into sports…. Did you think of a car washing one…with the soap the wax,a sponge..ect. Or a couch potato one with there fav snacks and drinks? Great question, Samantha! 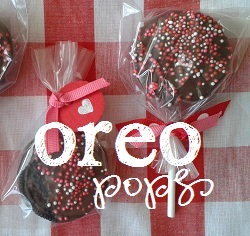 Dorie, I LOVE your ideas! I can’t top those!! How about a BBQ basket? Add BBQ tools, spices and sauces, a favorite drink, an apron (or nail apron) a cookbook or grilling magazine, and a gift certificate/card to a local meat market or grocery store. We have done this for a men’s gift exchange at Christmas several times. if the man was a gamer you could do a retro one . You can normally find the games for like 10 bucks that plug directly into the tv and have pac man and tetris and ect. and then plug it in with his fav snacks and popcorn. .. or what about getting him a giftcard to x-box live or even an itunes giftcard and then put some pj pants with a fav band or fav tv show … normally those run cheep at target and they alwyas have something on sale. Where do you get the cello bags? I looked at a couple places and couldn’t find anything even close. That does help! Thank you! I think I looked all over Walmart EXCEPT for in the fake floral section ha ha! My local dollar tree has them. Sometimes they are only in one color, such as pink, but they often have clear. I recommend adding a new theme: Movie theme! You can include theater candy, popcorn, a DVD (WalMart always has DVD sales for $5 a pop), a movie theater gift card, and a small stuffed teddy bear to watch the movie with you! 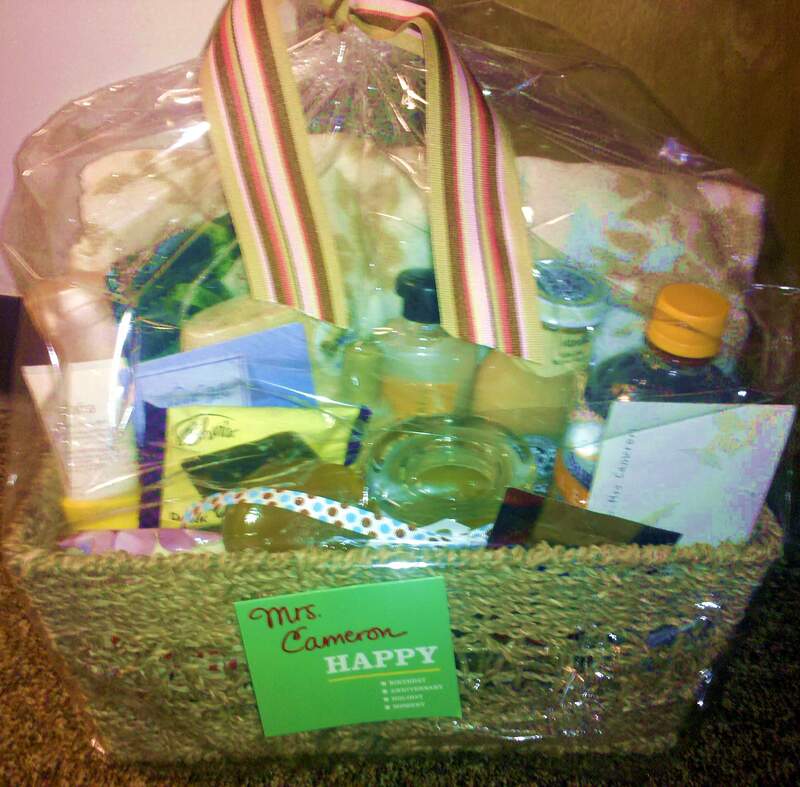 I am staying with a cousin and family here in a couple weeks and would love to give her a gift basket as a thank you. Do you happen to have any ideas/theme for that? Went through a phase when lots of friends & relatives were graduating from school and setting up their first homes. My standard gift was all kinds of little things that you find in a junk drawer – paper clips, rubber bands, erasers, post-it notes, pens, pencils, highlighters, kitchen sponges, small trash bags, nail files, fingernail clippers, aspirin, measuring tape, a mini level, a basic picture hanging kit (nails, hangers, wire), some basic tools (hammer, phillips & flat head screwdriver, pliers). I’d throw in some personalized items like candy or recipes for easy one-pot meals, and pack it all into a tool box or tackle box with wrap a big bow around it. It’s always a big hit! 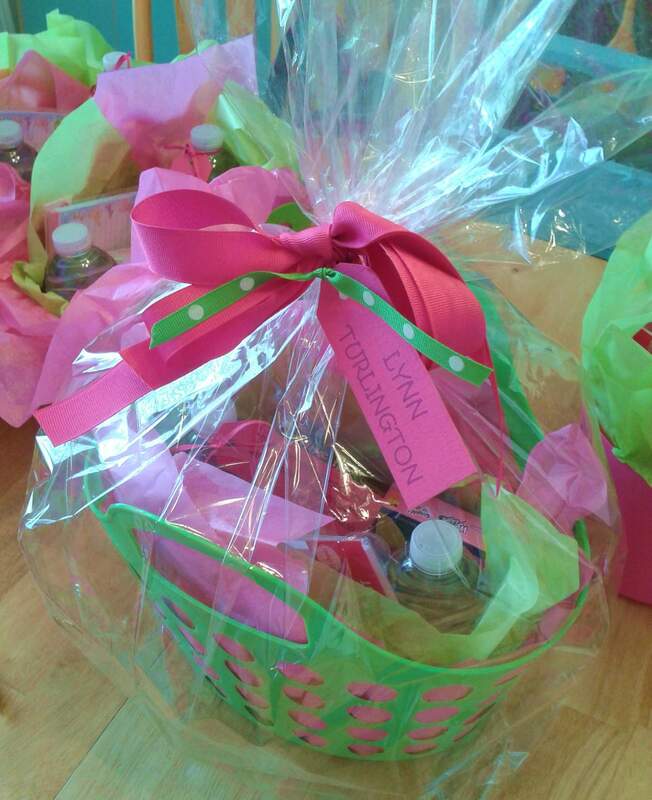 Love the ideas…homemade gift baskets are my fave gifts to give! At a bridal shower, we gave the couple a “Chinese food” gift basket; we used a wok as the basket and filled it with rice, chow main noodles, teriyaki sauce, soy sauce, chop sticks, and fortune cookies. These ideas are gold!! What about for a baby or wedding shower?? 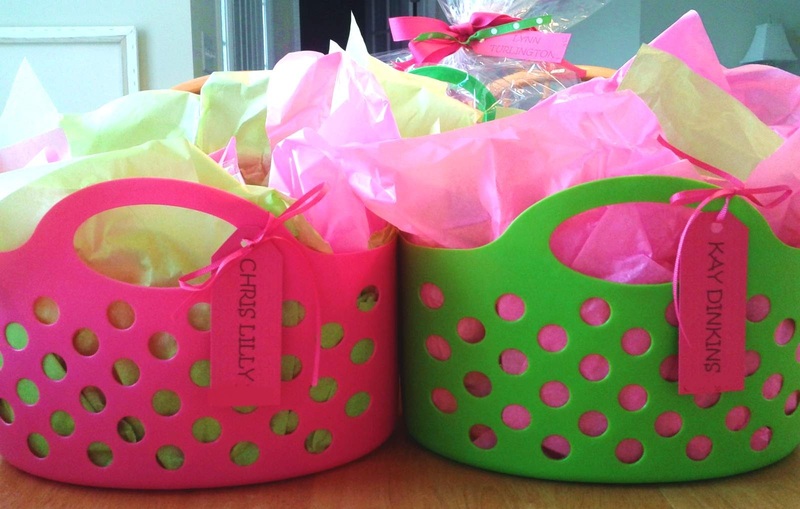 I have to say … as a teacher … your baskets are lovely! However… do you know how much cheap candy, lotion, etc. a teacher gets from the dollar store each school year? 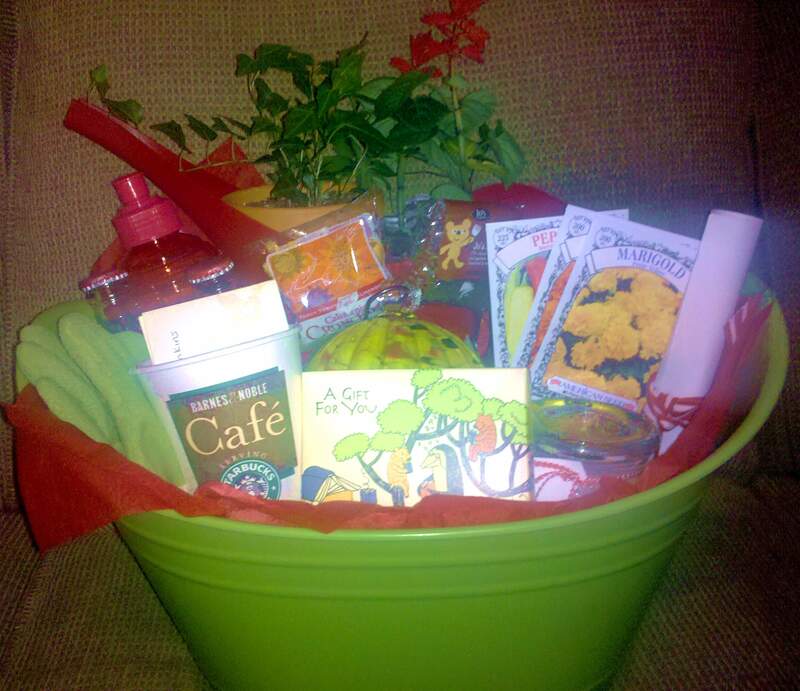 If you spent $10 on the basket, your best bet is to buy that teacher a $10 gift card to Target, starbucks, anywhere! It will actually get used and not thrown away/regifted and it’s easier on you! But i seriously love a themed gift. I love to add notes to each item. Like, Starburst candy:”You’re such a Star!” or pop rocks candy “You Really Rock!”. Gift baskets are so fun!! Instead of cellophane bags I use net (comes in many colors) from the fabric store. Use about 1 1/2 yards, cut in a giant circle and pull up and around gift and tie. 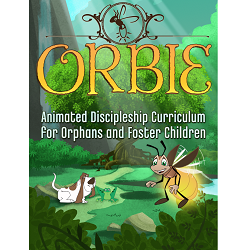 This is especially good for Easter baskets for your own children. You can keep from year to year, it never rips. Our school has the teachers fill out a little questionaire at the beginning of the year, with likes and dislikes, food issues (allergies, intolerances, diabetes etc), favorite color, etc. We even asked for the favorite Starbucks drink! I do tend to agree with “K” though that the teachers do get a lot of “stuff”, so our school asks the teachers in November for what they want and we make up little ‘ornaments’ with their wishes on them and families can buy what the teachers need. Some want a specific book for the class, or need supplies, even the secretary does one! I love that! 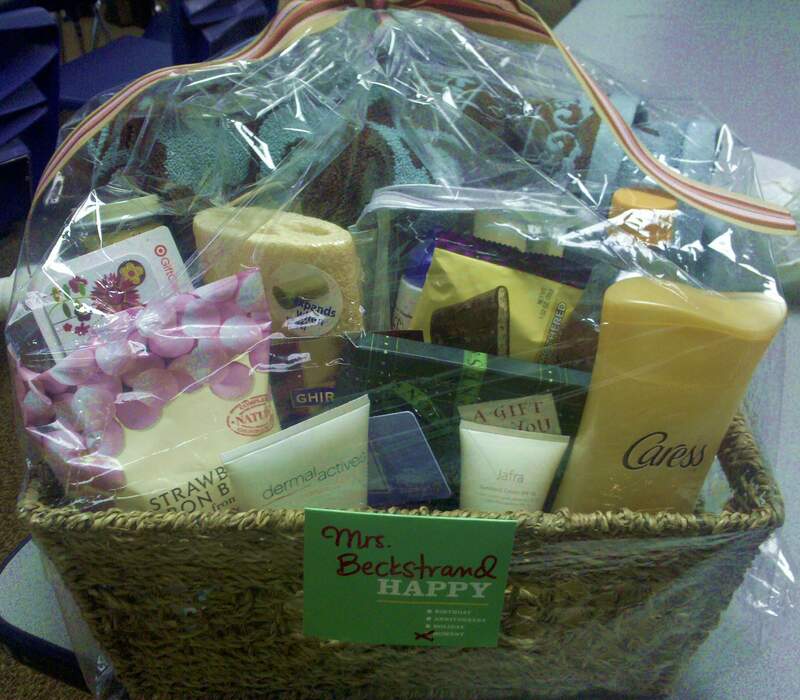 we’ve done a class supplies gift basket before with the teacher’s wishlist of printer ink, glue sticks, cardstock, etc. Great thought! Thanks for sharing! The store name is Dollar Tree. It has the green sign. If you don’t have one in your area they are online also. It can get confusing with Dollar Tree(Green) Dollar General(Yellow) and Family Dollar. Too funny. Valery, you have a black belt in dollar stores! Thank you for sharing your expertise! Have you ever done a bag for wedding guests at the hotel and what did you use? Since out-of-town guests might not be familiar with the area, it is nice to include a local map, perhaps with highlighted areas for events related to the wedding/rehearsal (one color), local areas of interest (another color), necessities like a grocery store, gas station, etc. (a third color)… Also bottled waters are a nice filler… The gift baskets done in the wedding colors are a hit… Gum or mints… If there is a favorite candy or snack of the bride & groom, that can be cute to include (you can print large avery labels with whose favorite it is to save having to write it umpteen times)… Ring pops… Make black “I’m with the groom” or white “I’m with the bride” t-shirts (or wedding colors)… flip flops, towel, sunblock for a beach wedding… Also, if guests are flying rather than driving, some nice sample size shampoos, conditioners, toiletries are nice… Hmm… off the top of my head… 🙂 Hope that gets you started! toothbrush small toothpaste, lotion, etc. Yes, love those thoughts for items to include. I’d definitely also add a journal or homemade booklet full of encouraging verses from the bible. Perhaps also a book of puzzles or sudoku? 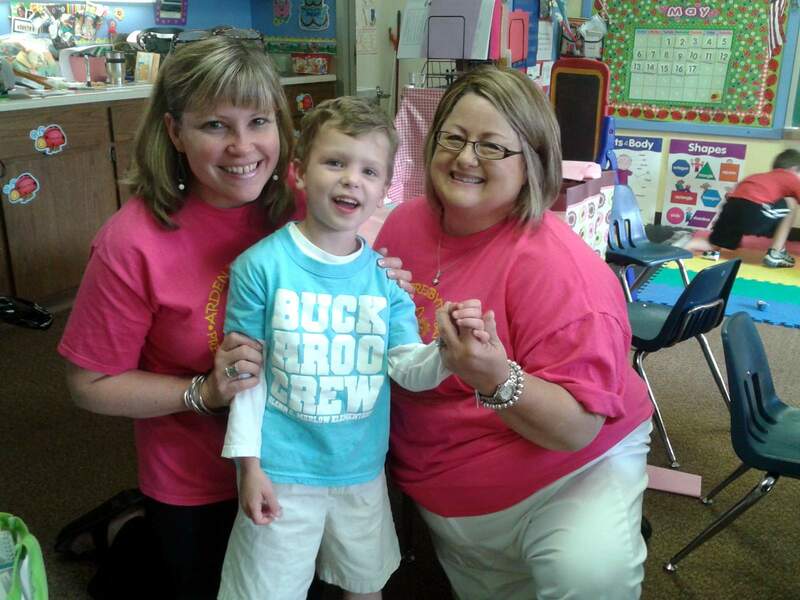 Melissa, I have 2 adopted children myself & belonged to an adopted family group. We had a “shower” for a family that adopted 5! If this is the family’s first children, laundry items would be a hit (thy were for the family we did), so your basket could be a laundry basket. I would also think entertainment items (movie tickets, water parks, etc) would be fun, since those things will now be expensive for 3 more! Good for you supporting this new family! I love this idea. I am always looking for good gift baskets for birthday parties and these are perfect. I love these baskets. You have such wonderful ideas. 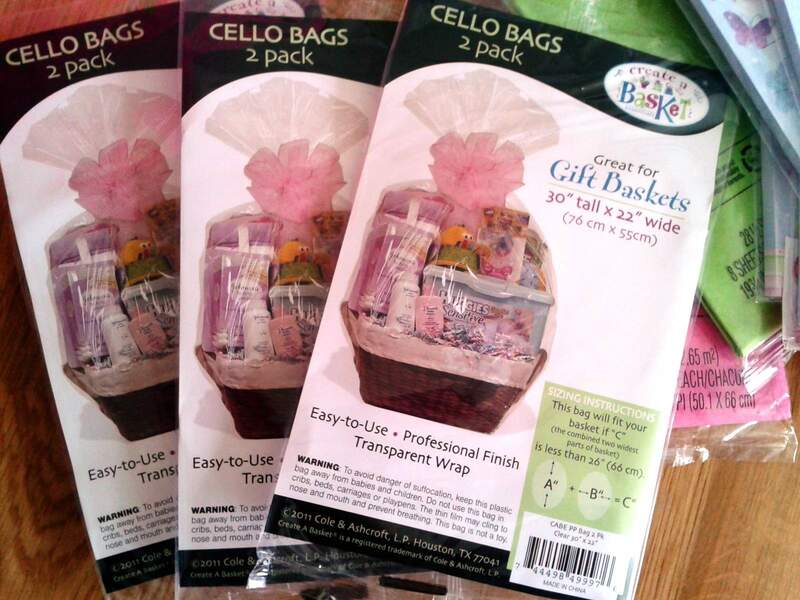 Where do you get the cello gift basket bags? Thank you. I got them in the fake floral section of Walmart, believe it or not… I think you can also purchase them at Michael’s craft store. 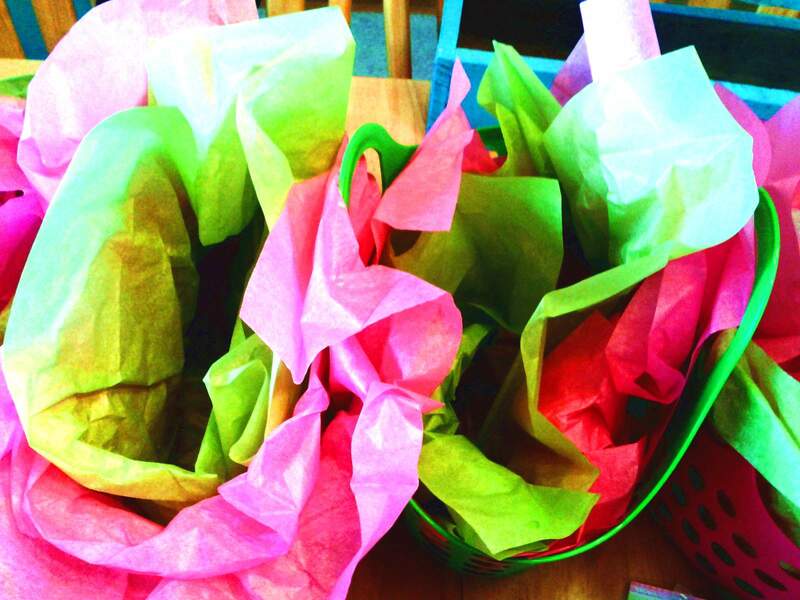 I LOVE gift bags and such – I like the way you think! I love to do swag bags for special occassions for my friends. 3 of us ran a half marathon and I made a swag bag of lip balm, mini anti chaf cream, hair clips (they have tons of curly hair) Advil for afterwards, and energy gels. For another girlfriends birthday we spent the day at a local resort by the pool. I put together acrylic tumblers with sun block, lotion, lilp balm, and hair conditioner. They were such a hit especially since we had cocktails by the pool in our acrylic tumblers. Another girlfriend is celebrating her birthday at a vinyard. I am a little lost for suggestions. Any imput? my niece is having her first baby in October and I was wanting to make a basket of things she might need while staying in the hospital after labor…any ideas? a dollar store, believe it or not! Dollar General, I think? Do you have any ideas on basket for bridesmaid? Do you have any suggestions for a 9 year old girls spa themed birthday basket? nail polishes, nail files (pink, of course), lip gloss, foaming face wash, fluffy flip-flops, spa robes (sew them yourself to keep them inexpensive? ), pink lemonade packets, Bath & Body Works items… So fun!! Very cool ideas! Will be sure to check back again! I love the out of town basket!! What would you suggest for a Fall rustic basket? I’ve been reading all you suggestions and I just need one special ingredient that I can’t seem to think of!! Any clever ideas? if there is a place near you that homemakes apple butter or pumpkin butter, a mason jar of that would be fantastic! sunflowers, pumpkin spice candle, lipgloss/chapstick (for those cool fall nights! ), bundle of twigs for “campfire starter,” instant hot chocolate/cider packets… hope this helps!! Thanks, those were great suggestions!! You are welcome, friend! Thanks for stopping by CampClem! I was an RA!! Love the “soda-lighted” idea… Is a can of soda about your budget? Thank you for your kind words and encouragement! Thanks for dropping in! LOVE, LOVE, LOVE YOUR BLOG!!!! Will be recommending to everyone I know! Fantastic ideas every which way!!! Oh my gracious! You just blessed me!! Thank you for your kind words! How about suggestions for a “Get Well” or “Feel Better” basket? I saw the hospital basket, but my friend will be at home after a medical procedure and I’d like something to brighten her spirits. And I just LOVE these baskets, BTW! I think they are so cute and creative and give the extra thought into a gift. I love your ideas. As a classroom teacher myself, I would have loved any of these gifts. The extra touches mean so much. I just saw the name on the gift basket. My maiden name is Turlington. There aren’t many of us around, so it peeked my interest. We like to call her Mrs. “Twirl”ington; she’s the extraordinarily gifted music & P.E. teacher at our preschool. Thank you for your kind words! SusanMcInnis Your blog is such fun! Really wonderful ideas! I find that I do well to pick up items on sale and with coupons. I am an aunt to some really wonderful kids and I know that they love crafts supplies for birthdays, Christmas, and special celebrations. Blessings to you and your family! 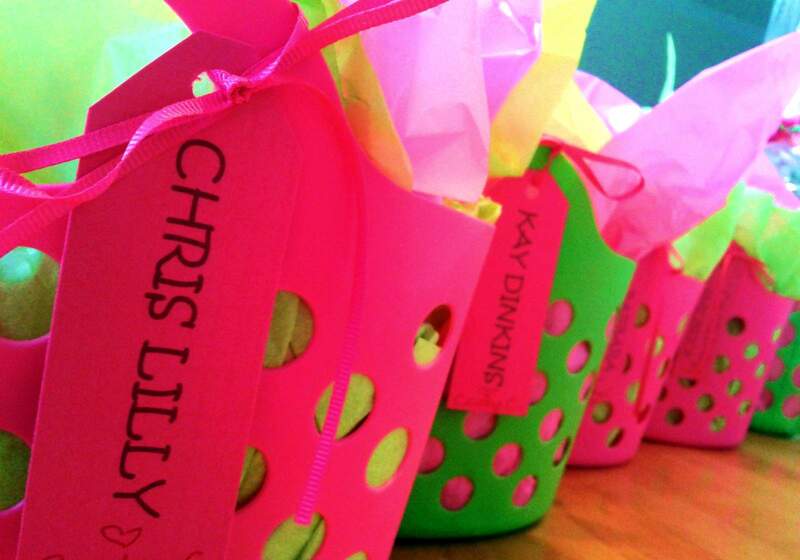 Where did you find these pink and green baskets? I’ve been looking for some for my classroom and can’t find any! Thanks! These came from Dollar Tree, but I’ve seen the same and similar baskets in varying sizes at other dollar stores, too. Happy hunting! I have a program at my school that requires a varsity cheerleader to pick a JV cheerleader as her “little sister” do you have any good ideas that I could put together for her as a gift? love this idea! you could use a school-colored small/ice bucket from the dollar store and put her name on it (vinyl letters in the other school color). Fill with gatorade (clear or–even better–school colored if possible!) for when she needs to refuel, maybe a school t-shirt/spirit wear or a personalized “cheer li’l sis” tee (use my fabric shabby applique tutorial to add fabric letters to a plain inexpensive t-shirt from craft store), candy (school colors again), any other school-related swag (mug/cooler cup, key chain, etc… I would love to make a gift basket for this theme!! So fun!! Good luck to you & your cheer li’l sis! Love your ideas. I’m wondering where I can buy the baskets, the pink & green ones. Fantastic gift idea for a scrapbooker! 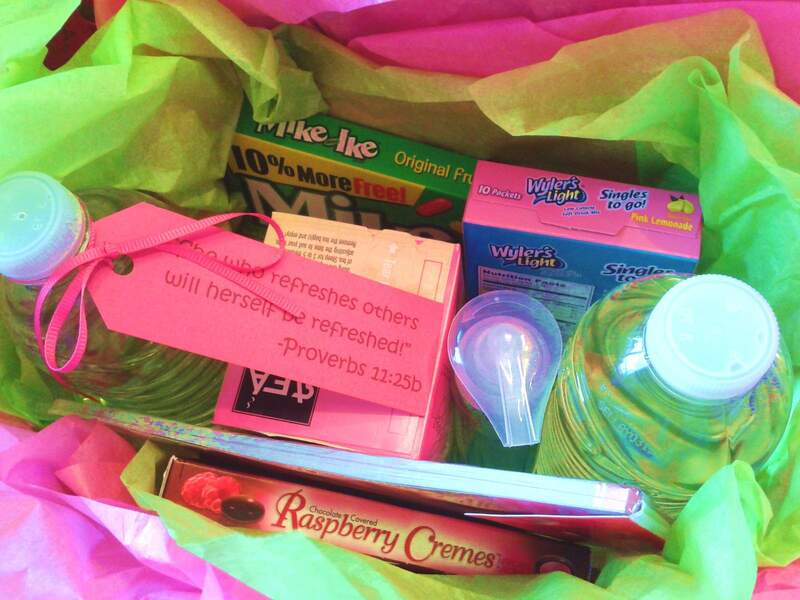 Awesome ideas… I love making the gifts for the kids teachers my problem is the male teachers…. Any suggestions on what to make for the men that is comparable to the women’s? Some people have listed great ideas in the comments section, if you want to scroll through all that… I guess I need to compile all the man ideas into one easy post, next! I made a really nice & substantial housewarming gift basket. i bought a nice sized bright green bucket & filled it with various cleaning supplies & tools. i bought most of the supplies at the Dollar Store & Lowes. I used coupons which saved me quite a bit i also bought double packs & multi pack items & split it up…. 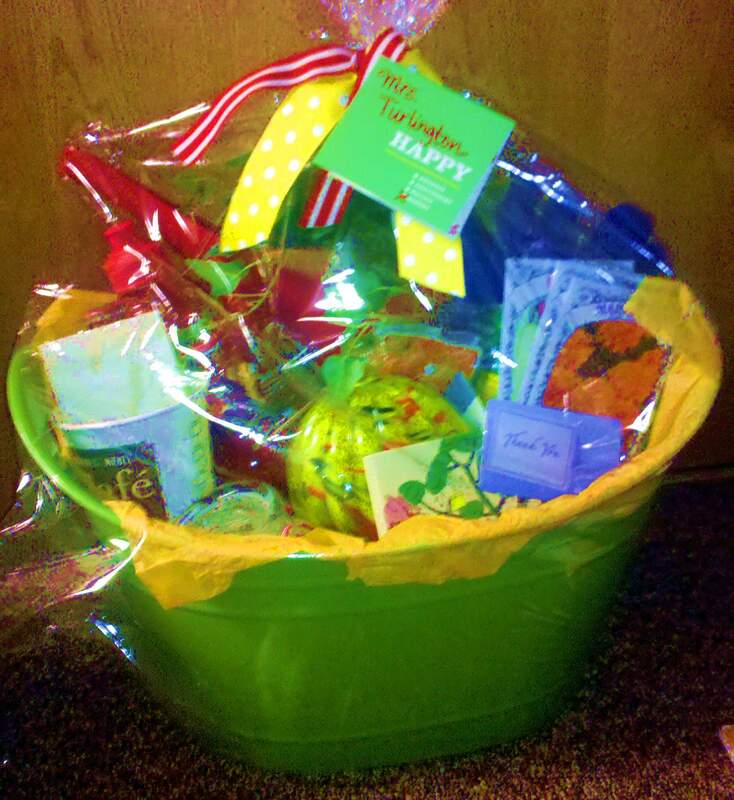 Cleaning supplies are a brilliant gift basket (or mop bucket) filler! Well done!! Thank you so much for the inspiration! If anybody needs a starting place, this post reminds me that Target and Michaels both have dollar sections with great basket fillers. Hi, I love this idea and am thinking of a basket for the bride/groom’s parents. Any ideas to put in a basket? 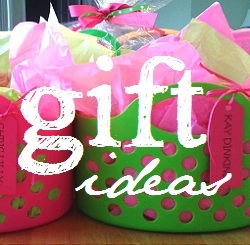 Cute idea for the gift baskets ! I’ve had this pinned for awhile and just got around to looking at it. I love theme baskets too!! Thanks for the great ideas. Love all your ideas! Your baskets are beautiful. Love these! I like doing arts and crafts baskets for the little people in my life 🙂 I add coloring books, crayons, colored pencils, watercolors, a pencil box, a pencil pouch, markers, a pad of thicker paper (for painting), stickers, colorful candy, and random odds n’ ends crafts items for doing their own projects (foam, pipe cleaners, glue, wiggly eyes, Popsicle sticks, etc.) The kids love them, and I love seeing my favorite little people get creative!! Love that! A great container for that gift basket could be a sectioned carrying caddy (I’ve seen them in the housewares/storage and bath sections before)–that way the “basket” serves as an organizer for all the craftiness too! For my daughter’s friends going to college we found oversized laundry bags at TJMaxx ($8) and filled them up with little bottles of stain removers and laminated instructions on how to do laundry. If budget allows can add a roll of quarters, laundry detergent, etc. The girls (& their moms) loved them. I have been a mute visitor of your site for quite sometime now.. Must say you are crafty to the core.. I am making these cute gift basket for my 3 yr son’s teacher.. Thanks lot for sharing such a wonderful and thrifty ideas.. 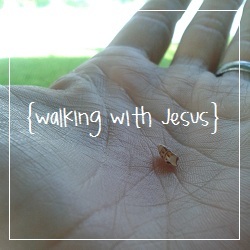 Thank you so much for sharing a comment! I love to know who is dropping in! Thank you for your encouraging words!! wouldn’t mind producing a post or elaborating on a few of the subjects you write related to here. Again, awesome web site! I am doing baskets for the in laws this year!!! I love the idea of the little handled baskets!! They are officially on my list to get for them!! I was wondering if you have any suggestions for a gift basket to give to a Mama who is about ready to give birth…not things for the baby, things for the mother. You could do a spa themed basket. Lotion, shower gel, bubble bath, candles and add a book by a favorite author and a favorite candy or drink. Also you could add a gift card to a favorite clothing store if its in the budget, or a small target or starbucks gift card. Where did you get the cello bags? As a teacher in a city school system where most kids are on assisted lunches, etc. , the rare gift is always cherished. If you want to give a gift or write a supportive note, it will always be cherished. Follow your heart and give with love, no guidelines are needed. If we donate your gifts it us probably going from our hands to those of a child in need. I love your baskets my daughter is graduating and would like to make gift basket s for her friends head ed to college do you have any ideas ? …Or maybe a cute collection of stationery, pens, paper, envelopes, stickers to write home/friends? What could I put together for a prize for Bingo that including nail items or a “sweet” basket? I did a little basket for my parents and my in laws for valentine’s day. I used the normal red theme and got candy, a magnet notepad, a cute little strawberry plant starter kit (my mil loves to garden! ), “lips” clips from target. Could also do nail polish with a nail file and nail polish remover. Comfy socks along with foot scrub and foot lotion. 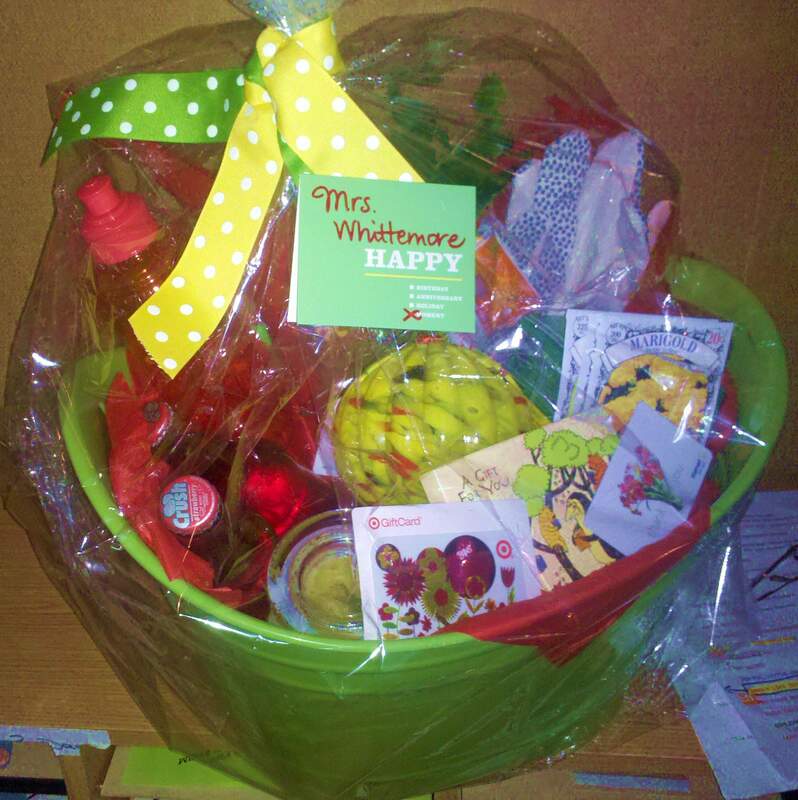 I love doing gift baskets and was so glad to read about more ideas. One idea i would like to pass on is if you are on a limited budget you can use a box of any size ( customize size for items) don’t use a lid.Cover box in gift wrap paper or funny papers,sport pages for the men( or woman) even a kitchen towel, beach towel.spa towel ect. I could go forever. I’m planning my soon to be 9 year olds “cupcake” bday party … thinking about sand buckets with some kind of a topper on them that looks like a cupcake …then filled with all the goodies. 😉 thanks for all the great ideas. Not to mention birthday gifts as well!! God bless you!!! My favorite gift basket I’ve made has been one for my son in his first apartment. His favorite is a handed down recipe for his Grandmother’s Mac and cheese. I got a recipe box with cards, wrote the recipe, and included the mixing bowl, silicon stirrer, grater, measuring cup, long pyrex bowl, medium pasta pot, Paprika, extra large elbow macaroni, cheese, canned milk, salt, and pepper. He made this for his buddies everytime they got together, so the gift was a great hit! Plus, he had a laundry wicker basket to use in his new home to boot! Hint: Tuesday Morning is the place I picked up good name brand cookware for this gift! I made a basket for someone who had lost her husband. Its a lot like a spa basket, but added a little more comfort. I added a soft blanket, chocolates, insperational quotes and hot tea. She said it was the most thoughtful gift ever received. Hi I was wondering if u can give me some ideas for back to school for teachers, secretary, administrator and principal since I didn’t get a chance to give them one for the end of the school yr I would like to give them each one for back to school. Thanks!!! Love your basket ideas. Here are some of mine. Movie basket with DVDs, popcorn, candy, and drinks. Soup basket with canned soup, dry packs, soup bowls, and crackers. Spaghetti basket with boxed spaghetti, jarred sauce, Parmesan cheese, and pasta bowls. These have always been appreciated. As a teacher, I wanted to point out that (unless the gift is Sunday school teacher) it is never appropriate to include bible verses on a gift/tag. Please be respectful that a teacher may not share your religious beliefs, and just leave the bible verses out of it. I was wondering if you have any suggestions for 21st birthday? Hello 🙂 I have a friend whose 21st birthday is coming up soon ! like in a week. 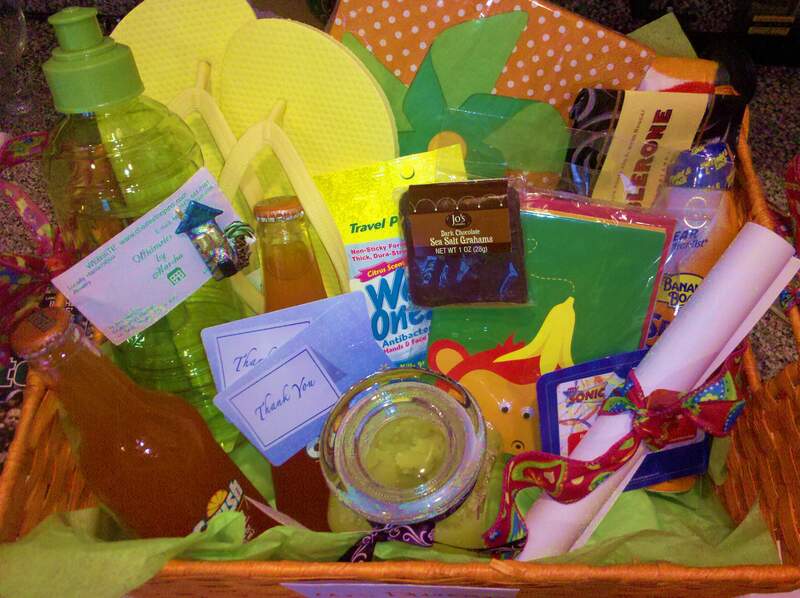 I was hoping you could help me put together a “hangover recovery” basket for her. Im not sure what I would put in the basket or how I would go about making it. Please email me if you could helpp. thank you. Love this!!! Where did you get the baskets? I love your gift baskets design. So, those are Dollar Tree baskets. I have to check out my local Dollar Tree love those colors. I am very interested in all your ideas, they will be great for future gifts. I am having trouble trying to put together a basket for a friend of mine who is a single mother, works so hard to provide, and still is having trouble making ends meet. She has 3 older boys that are still living with her. I want to make something special and something that would help her out. I would be grateful for any ideas you can give me. She’s not really into any spa items or anything like that. PLEASE HELP!!! That is so kind of you to try to minister to your friend in that way! I might think about the things she might like to do/use but that she does not treat herself too because she is trying to keep afloat–so items like a chocolate bar, favorite nail polish, or lip stick might be a hit. But something fun like Dove Dry Shampoo could be a great time-saver for her to try when she is getting ready, but not something she might buy on a tight budget. I would definitely include a gift card to WalMart, a grocery store, or a gas station for food or gas if her funds are tight and you are able. You could also make a little booklet that gives her “coupons” for free babysitting. I hope these ideas help! A nice surprise for a working single mom, if you are able, is to surprise her at work and take her to lunch or if she doesn’t have time to go out, take her lunch and eat with her. Get her out of the work place for a few minutes. Or take her out to dinner. Sometimes you just need a change of “face and place” for a little while. I find computer printed coupons for help with errands, house cleaning, a free car wash, some things that you would like for someone to do for you is a hint a single mom would probably love. Hello everyone! So glad I came across this, you all have some awesome ideas! I am hoping some of you can help me with an idea for a wonderful couple that are neighbors of mine only a couple blocks away.. I have lived here 5 years but only met them a couple days ago when I had an unfortunate accident and a tire blew turning a corner, and I ended up across the street from their house in another person’s yard with my 4 younger boys in the van with me. They came to our aid and stayed till we were able to leave in the ambulance. I found out about an hour later they were in the waiting room and even tho I let them know I appreciated them being there, everything would work out fine and they could go home.. They stayed and when they found out my husband was having a hard making it there to get me they offered to pick him up and bring him to the hospital. We ended up having no vehicle, now out of 4 carseats and our 3 yr needed to be transported to another hospital an hour and half away with a concussion. This wonderful couple pulled together some friends that had some carseats and gave us all a ride home. Knowing we had no way of getting to our little boy then offered to let us borrow their vehicle for tonight and drop it off in the morning. I am still absolutely amazed by these people that I had no clue lived down the street from me. The Gentleman is a minister and his wife is a teacher and they are very church going people. I feel very much like I want to send them something as more of a thankyou and would love to hear any ideas. Sorry for the long post but I thought you all would need a bit of background. From what I heard the way the van looked, we were very lucky to have survived, so I really do believe they were a blessing from God and their prayers helped us all thru. Blessings to all of you and your families! Could I get some ideas for Christmas? like I don’t have ton money and I want do 1 gift for whole family with my mom and dad and my husbands mom and dad and brother. What could I do? My brother got married a few months ago. While looking for inspiration on their gift registry I noticed some copper Moscow mule mugs which led to, you guessed it, themed gift basket! I included a bottle of vodka, ginger beer, an awesome pottery barn horse ice bucket and shaker, drink stirrers, jiggers, limes, a laminated recipe card, and some other random related items. I saved on the basket itself by getting a huge wicker one from the thrift store and spray painting it a cool color. It was such a fun gift to put together and my brother loved it!